Kataragama has for centuries uncounted been the destination of yogis, bawas, sadhus, tapasvis, and siddhas of all schools of spiritual practice. Of these saints and sages, most by far have preferred to remain anonymous, leaving no trace except the spiritual influence of their paramparas. A few however are remembered by name together with a few facts about their life achievements. Following are a few recorded details of some of Kataragama's sages down the centuries. The greatest sage known to Kataragama devotees is Swami Kalyana Giri. Actually, there were three sages known as Kalyana Giri. The third Kalyana Giri is said to have built the present Maha Devale with the help of King Rajasingha I. His guru's guru, the first Kalyana Giri Swami, originally came from North India. Centuries ago, it is believed that the first Kalyana Giri Swami, a North Indian Dasanami sannyasin, was prompted by the Kataragama God's senior spouse Thevayanai Amman (Sanskrit: Devasena) to leave North India and come South to find her missing husband and bring him home. Kalyana Giri Swami arrived to Kataragama where he performed severe penances and austerities for twelve years, including a vow to abstain from sleep. During the course of his intense tapas, he was served by a little Vedda boy and girl who attached themselves to him. One day, exhausted by his austerities and depressed by his failure to obtain audience (darshan) of the God, he fell asleep. The Vedda boy came and woke him. Furious, he cried out in anger, "How dare you disturb my rest when you know this is the first time I have slept for years?" The boy uttered an excuse and ran pursued by Kalyana Giri until they reached an islet in the Menik Ganga. Suddenly the boy transformed himself into the God Skanda before Kalyana Giri's astonished eyes. The awe-struck hermit then realised that all along his constant attendants had been none other than the God himself and his consort Valli. Prostrating himself before the holy couple, he prayed for forgiveness and begged the God to return with him to India. 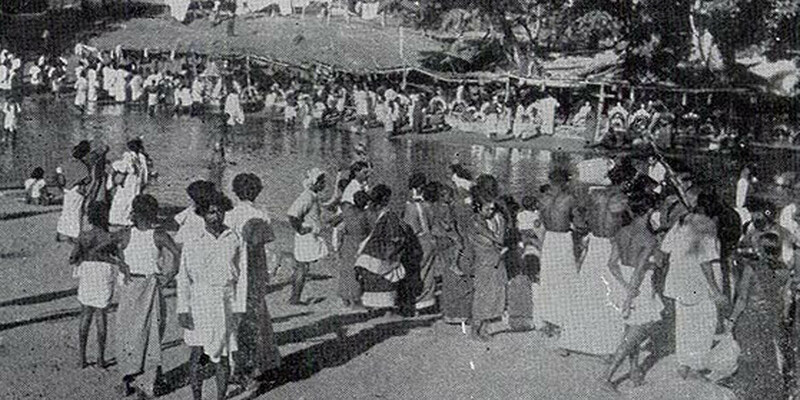 Valli however intervened and appealed that she could not bear to leave Kataragama and be parted from her Vedda kinsfolk. She begged Kalyana Giri Swami not to take her husband away. The sage could not refuse. He abandoned the idea of accompanying the God back to India and settled down at Kataragama where he engraved the yantra (mystic diagram) and enshrined it for worship. To this day it is this yantra that is worshipped and carried by tusker during the annual peraheras at Kataragama. Kalyana Giri Swami never returned to India but remained and requested Thevayanai Amman to come and settle in Kataragama also. Thevayanai Amman came and since that time all three deities have lived happily together in Kataragama. The Dasanami rituals and parampara of Thevayani Amman Devasthanam also begin from the time of the first Kalyana Giri Swami, some time between the 8th and 16th century CE. Kalyana Giri Swami then founded Thevayani Amman Devasthanam. The North Indian Dasanami succession has continued unbroken to this day. Kalyana Giri Swami thus became the founding abbot or mathadhipati of Kataragama Thevayanai Amman Devasthanam. Since that time an unbroken succession of North Indian Dasanami mathadhipatis has administered the Math and associated temples. After his jeevan samadhi, Kalyana Giri Swami's body slowly metamorphosed into a swayambhu lingam, having the appearance of a pearl. Hence he is also commonly remembered as ‘Muttu Linga Swami'. Jayasingha Giri Swami hailed from Uttar Pradesh and lived in the late 18th Century and 19th Century. His guru's guru was the third Kalyana Giri Swami, who built the present Ruhunu Kataragama Maha Devale. Dr. John Davy of the Ceylon Medical Service met this Swami in 1819 while accompanying Sir Robert Browning, the Governor General of Ceylon, on his tour of the Central and Uva Provinces, and reports this meeting in his ‘Account of Ceylon' published in 1821. Davy describes Jayasingha Giri Swami as speaking of his predecessors with an air of solemnity and enthusiasm that seemed to mark sincerity and, combined with this peculiar appearance, was not a little impressive. "He was a tall spare figure of a man, whom a painter would choose out of a thousand for such a vocation. His beard was long and white; but his large dark eyes, which animated a thin regular visage, were still full of fire, and he stood erect and firm, without any of the feebleness of old age." Bala Sundari was the eldest child of a North Indian Raja, a boon from God Kataragama in answer to a vow that, if blessed with children, the first born would be dedicated to his service. When the Rajah forgot his vow, the God rebuked him sternly and threatened him with disastrous consequences. This led to her being brought by the father while still a child and left at Kataragama with a suitable retinue. She lost all ideas of the worldly life and entirely devoted herself to a life of spiritual discipline and practice. Bala Sundari was a very pious lady and a paragon of beauty. The fame of her beauty reached the King of Kandy, who sent her offers of marriage, which she rejected. It is said that, being furious at her refusal, the King of Kandy sent troops to fetch her to the palace. She prayed to the Kataragama God and her prayer was answered in 1814 such that her life of celibacy and sadhana was saved. The God intervened and sent British troops to attack the citadels of Kandy. Ultimately the King was taken prisoner and deported to Vellore in South India. The lady, thus saved from the King's rough gallantry, lived to a grand old age, loved and revered, and died at Kataragama after installing Mangalapuri Swami. Mangala Puri Swami was also a great sannyasin of the 19th Century who hailed from Varanasi (Benares). He met E.A. King, the Assistant Government Agent of Hambantota in 1870. King writes that "at this temple, I met another Brahamin from Benares, who spoke English well, and had a very suave manner." "He said that he was issuing rations to the troops in Lucknow at the time of the Mutiny (of 1857) and that his age is 80. He does not look it." 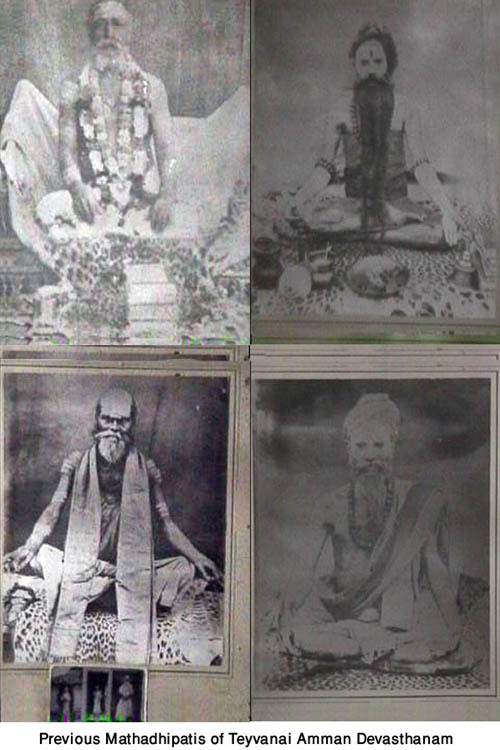 Mangala Puri Swami died in 1873 and was succeeded by Kesopuri Swami. 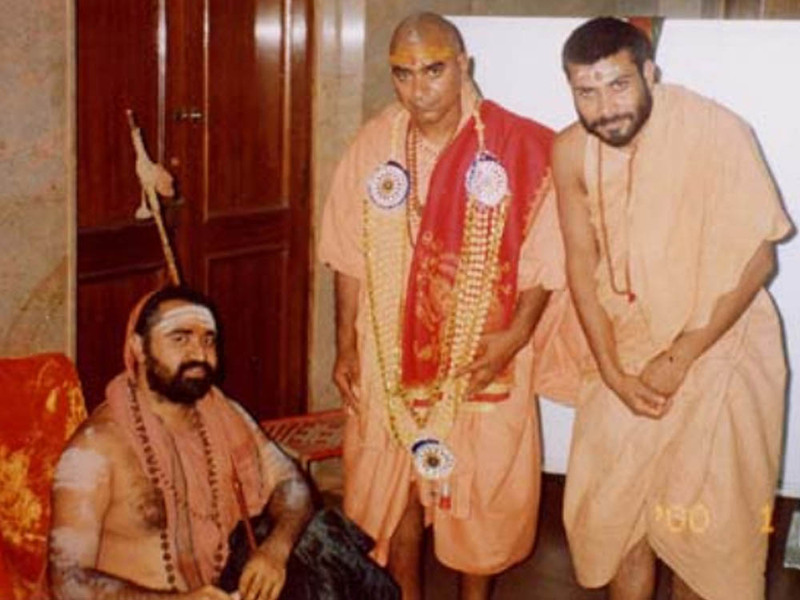 His Holiness Vijayendra Saraswathi Swamigal (seated at left) appointed Purnānand Giri Swami (center) as Mathadhipati and Vigyananand Ashram Swami (right) as Deputy Abbot of Kataragama Teyvanai Amman Math in January 2000. 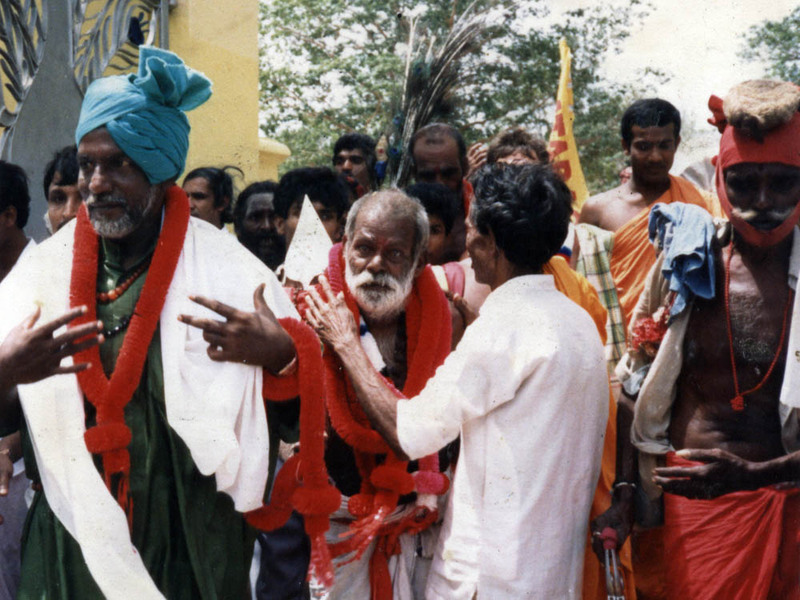 Muttukumar Vel Swami (center, bearing Vel) and other Pada Yatra swamis arriving by foot from Jaffna are met and honored by Sufi bawas, sadhus, Buddhist monks and others at Ruhunu Maha Kataragama Devale main gate, July 1988. Kesopuri Swami was for about three quarters of a century a revered figure at Kataragama. Better known in Ceylon as ‘Palkudi Bawa' on account of his living on pal or milk, he hailed from a high class Brahmin family of North India and embraced the life of renunciation at a Dasanami monastery in Allahabad at an early age in 1820's. Spurred by the fire of renunciation, he roamed the length and breadth of India and came to Ceylon during the early part of the 19th Century. He arrived to Kataragama, attached himself to the Teyvayanai Amman Devasthanam, and found the place especially congenial for sadhana. After some time the lad betook himself to the forest, where he lived alone for years, until he was sought out and found by a young monk, Suraj Puri Swami, who would wait upon him and feed him with rice. Soon Keso Puri Swami Maharaj gave up eating all solid food and confined himself to a little milk, hence he was known as Pal Kudi Bawa. A very saintly and picturesque figure, he was revered for his childlike simplicity, purity, spiritual insight and devotion, and much sought after for his blessings. He died in Colombo in 1898 after executing the Theivanai Amman Trust deed on 9 March 1898 (No. 2317, J. Caderman, J.P.). Suraj Puri Swami, the spiritual successor to Palkudi Bawa, was a beautiful character, pious and learned, and with a splendid physique. He had been a cavalry officer of the Maharaja of Kashmir and, being resolved on a life of celibacy and poverty, found himself thwarted by his relatives who pressed him to marry and assume the duties of family life. Failing in their efforts, they brought the influence of the Maharaja of Kashmir to bear upon him, whereupon he fled from home and traveled as a mendicant until he reached the great southern pilgrimage shrine of Rameshwaram. There he received a divine call to proceed to Śrī Pada. Here he was ordered to proceed to Kataragama, where he would find a hermit in the forest whom he was to wait upon and feed with rice. The saint whom he ultimately discovered there was his guru Pal Kudi Bawa. The body of Pal Kudi Bawa and several of his successors have been interred beside Guru Asanam at Theyvanai Amman Devasthanam where their samadhi shrines are accessible for public worship.